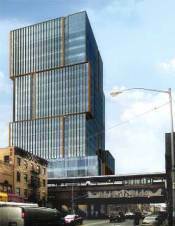 Sale of 1800 Park Avenue in Harlem is completed | HarlemGal Inc.
We have more Harlem real estate news to report. HarlemGal Inc received a news release recently announcing that Vornado Realty Trust has “completed the previously announced sale of a parcel of land known as Harlem Park located at 1800 Park Avenue (at 125th Street) in New York City for $66 million…” The sale was finalized in the last 48 hours. This entry was posted in 125th Street, commercial real estate, Harlem, Harlem bloggers, Harlem blogs, Harlem commercial real estate,, Harlem real estate,, HarlemGal, New York, New York City, NYC, real estate and tagged 1800 Park Avenue, Bruce Eichner, Harlem, Harlem Park, Harlem Real Estate, HarlemGal Inc., Park Avenue., Vornado Realty Trust. Bookmark the permalink.